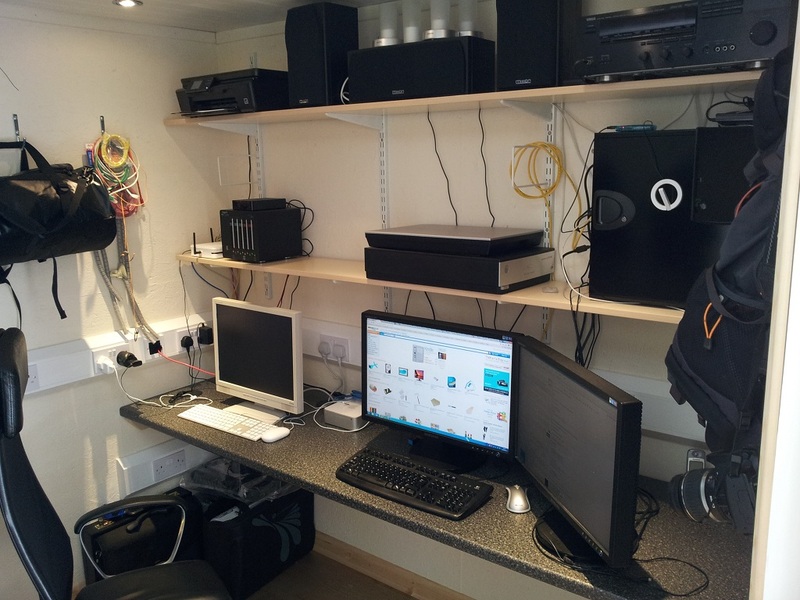 All of my technology was laid out perfectly to hand including my main PC, laptops, scanner and printer. 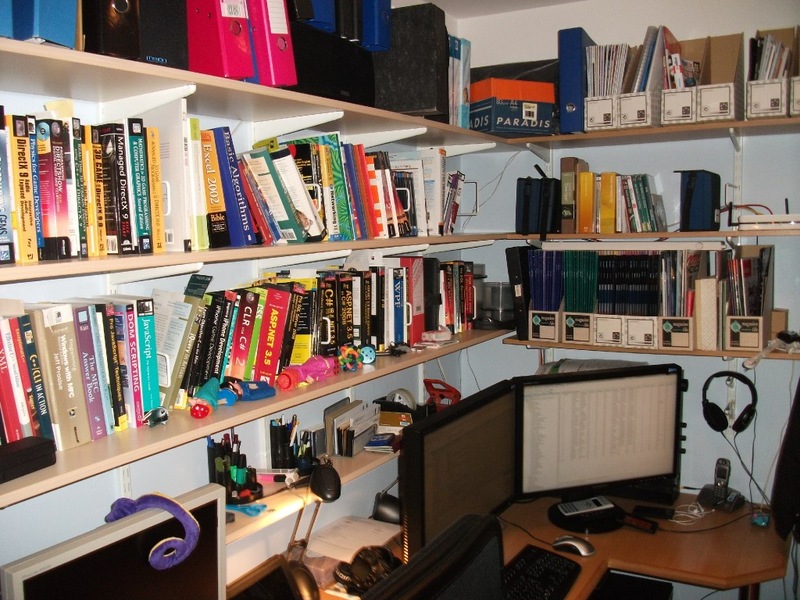 I also had shelves containing loads of programming books from various projects as can be seen in the photo below. I also had about 8 large ring binders containing company accounts and various other paper based records. Our second child came along in mid February 2012 and we decided to turn my office into a nursery and relegate me to an office in the garage. Not just the cold garage, but a proper boxed out section of it with sockets encased in trunking, proper lighting, fitted radiator, insulation, alarm etc. The design I came up with using a google docs drawing is below. Basically, just box out a section of the garage and have a made to measure desk fitted with wings on either side as shown in my initial design below. This was an easy decision to make because it would keep all of my computer kit and books in one place away from the main house. And the 2 kids would be able to use the 2 bedrooms to run in and out of safely without running into laptops and tripping over cables. Below is a photo of my completed new office space which I have been using for a few weeks now ( I decided to lose the wings on the desk because that would make me feel a bit boxed in ). Now as you have probably noticed, the stacks of computer books I owned have disappeared from my new office. They were passed over to the charity shop and the out of date ones were chucked into the recycle bin. I decided from now on to just use on line reference, eBooks and PDFs. This should save loads of trees and save clogging up my new office. With regards to my accounts files disappearing, that’s thanks to Clearbooks on line accountancy software. Prior to Clearbooks, I was using a simple spreadsheets to store my accountancy entries. Basically I was keeping track of money coming in and money going out. And I was producing invoices in Microsoft Word. At the end of the financial year, I was passing this information over to my accountant. If you are a small self employed contractor, you probably know what I am talking about because loads of people do it this way. Clearbooks is great on line accountancy software which enables me to do all my accounting in the cloud. It keeps track of my sales and purchases. It tells me how much money I have in the bank. It produces my invoices. It stores my receipts. It even produces my quarterly VAT report. Highly recommended – I never thought I could ever get excited about accountancy software. With regards everything else, I set up an Evernote account. So all of my computer notes and other stuff gets dropped into an Evernote notebook. This means that all my files are available on all of my devices – even on my phone. Previous to this, I used to have notes and bits of paper all over the place. Its a good job I was in between contracting jobs because it took me ages to scan stuff in and get my new office sorted but it was worth it in the end. 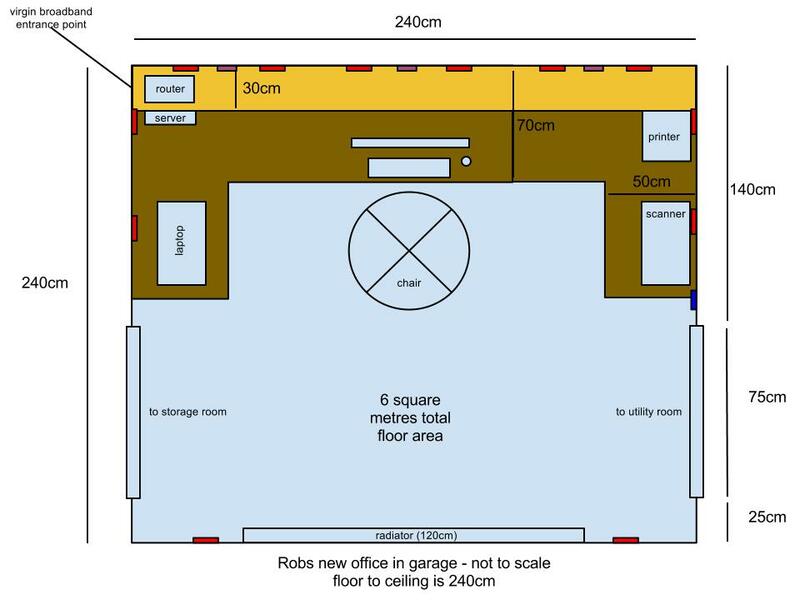 The total price of my office refit came to £2220 consisting of £1000 for labour costs and £1220 for materials. This included everything ( timber, insulation, electrical, plumbing, archtrave, skirting, flooring etc ). And for good measure I got rid of my TalkTalk 8Meg connection and had a Virgin Broadband 100Meg connection fitted instead. 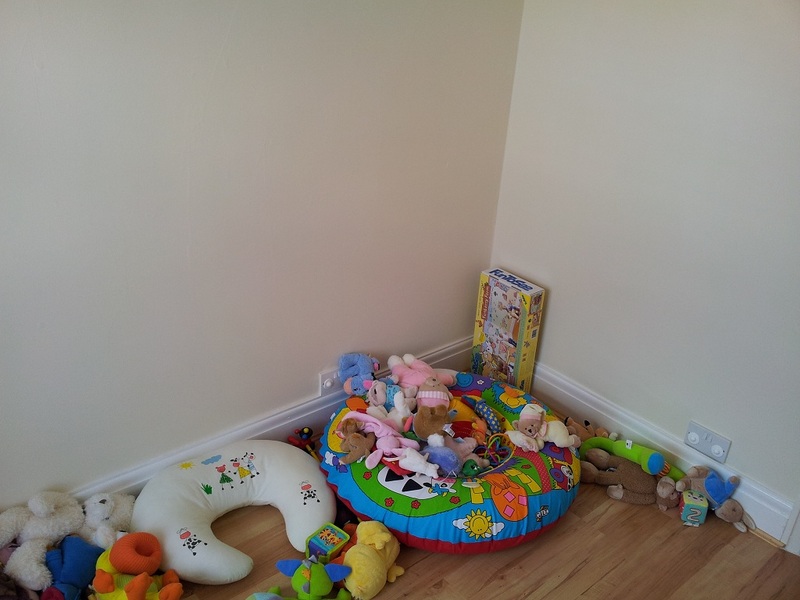 Below is a picture of my old office on its way to becoming a nursery.